How was your weekend? The highlight of my Saturday night was doing some light housework while jumping on random Instagram lives. When the notification came in that Megan Milan was live, I decided to join. It was pretty casual with no real agenda. She did the IG live to give a quick update to her fans and answer questions in the comments. I sat patiently and waited for the person to ask the question that has been on my mind since I first seen a pic of her. Megan's skin is amazing. I couldn't believe that no one asked her to divulge her secrets. I waited long enough, I finally jumped in her comments and asked her to reveal her favorite skin products. As soon as she read my question, her whole demeanor changed. Suddenly, her voice was full of excitement and energy like she was waiting for someone to ask. She responded by saying, "my skin favorite product is witch hazel. Witch hazel! Witch hazel!" Megan continued on with a story. "Once I had these stress-induced breakouts that were so bad that I thought I might need to see a professional." Mind you, Megan is an aspiring model so having clear skin is an absolute must. She tried all these natural products and nothing worked until she tried witch hazel. Soon her skin cleared all the way up and she's been singing the praises of witch hazel ever since. The other product Megan gave props to was coconut oil. She uses all natural coconut oil as a moisturizer. Let's add her to the list of beauties who attribute their glowing skin to coconut oil. So what's so special about witch hazel? One website proclaimed that witch hazel as one of the most powerful natural acne treatments known to man. It's a powerful astringent with the ability to kill acne-causing bacteria. Witch hazel is an amazing toner that can remove excess oil deposits and clear out pores. Did I mention that witch hazel is also an antioxidant? Not only is your skin getting the anti-inflammatory, acne-fighting benefits, but you there's also the anti-aging factor due to the antioxidant component. That's what makes witch hazel so amazing. After Megan revealed her favorite product, a bunch of other people in the chat co-signed on how witch hazel helped them. I had a few pesky little breakouts so I decided to give witch hazel a try. I pulled out a bottle buried deep in my product closet. For the last couple of days, witch hazel was my main astringent and, I'm happy to say, that I'm completely acne free this morning. Let's not forget that witch hazel also has the power to help create this type of transformation. Yay for witch hazel! Thanks Megan!!! The other pressing question that several people asked Megan was regarding her signature lip color you often see her wearing in most of her pics (NSFW). 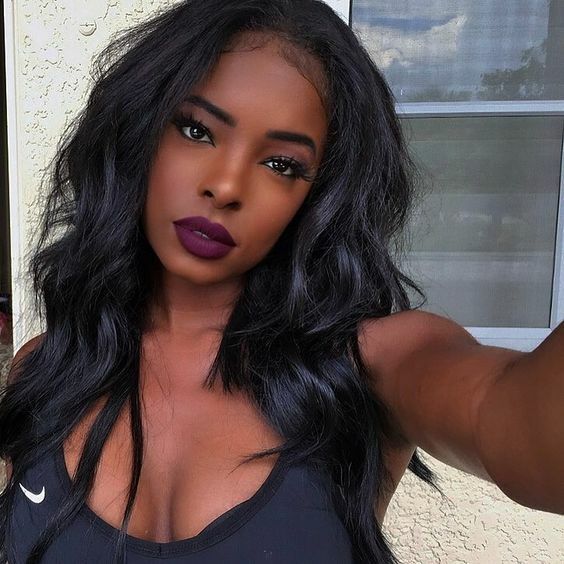 It's a deep wine color that looks amazing on her skin. Megan confirmed that she has one lip color that she pretty much wears all the time -- Stilla's all day liquid lipstick in Chianti. Stilla boasts of 6 hours of budge-free longlasting wear. It's also infused with vitamin E and avocado oil to help keep lips moisturized. Even after eating and drinking Chianti still looked great on her in the video. But instead of the rich plum color, it had faded into more of a muted mauve shade. Lastly, Megan was asked to share her favorite workout for toned abs. Without skipping a beat, she blurted out "Russian twists.... that's all you have to do and it gets your stomach together." I had no idea what Russian twists were so I headed over to Youtube for a visual. Anyone who's done Russian twists before know that this is a total ab workout. It strengthens your all parts of your core. It's obviously an awesome oblique exercise, but this movement also targets your main abdominal muscles as well. And, if you make sure to pull your stomach in during the workout, you'll also engage your transverse abdominal muscles (your inner corset). Russian twists also involve a lot of back and spine movement so if you have any back issues, you may want to skip this one. Check out 4 ways to do the Russian Twist from beginner to advanced level. I've recently been using witch hazel myself, but unfortunately not consistently. After reading your article, I'm excited to ramp up my use of the miracle product. Do you happen to know which type of witch hazel is more beneficial? Specifically alcohol vs. alcohol free? I would say to go with alcohol free, especially as drier weather approaches. I so agree with the Russian twists. I did that combined with accordions and my waist shrunk in a couple weeks. I started doing them again last week to get myself snatched for grad next month. Fingers crossed. Thanks for letting us know! I definitely have to make this a part of my normal routine.